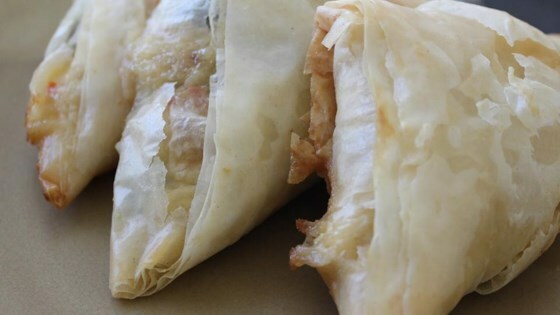 "The only tricky part of this recipe is working with phyllo, and once you get the hang of it, it's fun. Sometimes you get a bad batch of phyllo that rips and tears easily, so I always buy an extra just in case. I have frozen these before baking. Just add a few minutes to cooking time when you cook them in a frozen state. I have also doubled this recipe for large parties." Heat olive oil in a medium saucepan over medium heat. Slowly cook and stir onion until tender, about 5 minutes. Mix in spinach and salt. Stir in feta cheese, cottage cheese and egg. Cook and stir until thickened, 5 to 10 minutes. Reduce heat to simmer. Unroll phyllo dough sheets one at a time on a flat surface. Brush with unsalted butter. Cut into strips approximately 5 inches wide. Place 1 tablespoon of the onion, spinach and feta mixture at one end of each dough strip. Fold the end of the strip over the filling so that it forms a triangle. Continue folding the strip in triangles until a small, triangular stuffed pastry remains. Brush with unsalted butter. Repeat with remaining phyllo dough. Arrange stuffed triangles on a large baking sheet. Bake in the preheated oven 12 to 15 minutes, until golden brown. Serve warm.